Marc Guggenheim talks about Amaya's decision on DC's Legends of Tomorrow. The Legends reunited last week for the Season 3 premiere of DC’s Legends of Tomorrow, but one key member of the team wasn’t seen with the crew: Amaya, as played by Maisie Richardson-Sellers, who left the present day to fulfill her destiny in 1942. 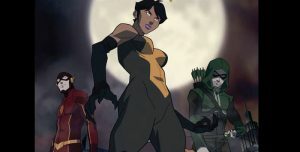 Once Amaya is back with the Legends, we’re going to see the team encountering one of her descendants: Kuasa, sister of Megalyn EK’s Vixen from Arrow and the Vixen animated series who has powers of her own. 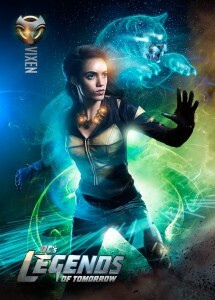 Kuasa appeared in Season 2 of the CW Seed Vixen series, though Guggenheim promises that it’s not critical to have seen the animation prior to Kuasa’s Legends debut. “They’re all designed to stand on their own, even though they do interconnect, and that’s because we never want — especially as the universe grows bigger and bigger, we never want any of the shows or animated spinoffs to be required viewing. We don’t want people to feel like they’ve got to do their homework before watching any of these shows, or any individual episode,” Guggenheim promises. A new episode of DC’s Legends of Tomorrow titled “Freakshow” airs tonight (October 17) at 9PM ET/PT on The CW. Take a look at some preview images here!